This fragrant Thai mussel recipe makes a superb gourmet appetizer to serve guests or that very-special-someone in your life. 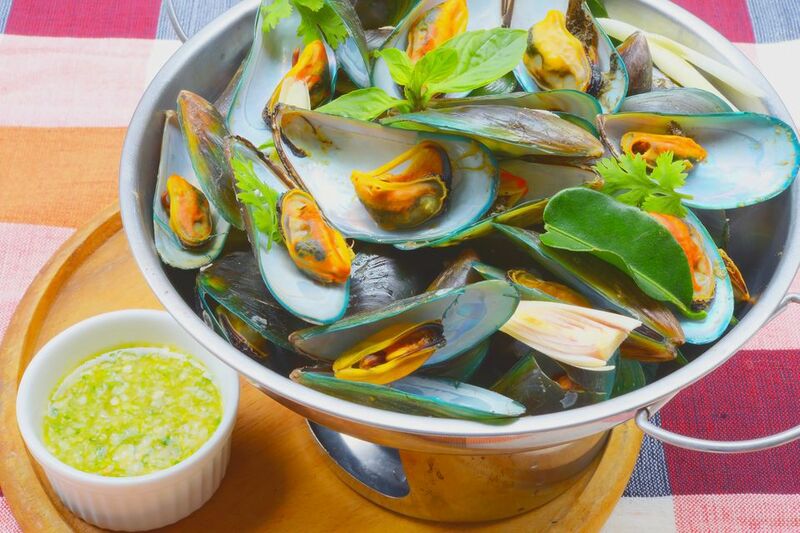 Thai herbs and spices, such as lemongrass, lime leaf, fresh coriander, and basil, create a wondrous broth that marries perfectly with the taste of the mussels without ever overpowering them. As a bonus, this mussel recipe is simple to put together and will be ready in just minutes. Pair with a nice wine and good company, and enjoy! Pour chicken stock into a wok or large frying pan. Note: You will also need a tight-fitting lid. Add the minced lemongrass (including the upper stalk), plus the lime leaves. Bring to a boil over high heat, then reduce to medium-high. Add the wine, vinegar, chilies, fish sauce, sugar and 1/2 cup chopped coriander. Stir to incorporate. When the sauce is gently boiling, add the mussels. Stir them in, then cover with a tight-fitting lid. Cook for 2 to 3 minutes. Remove lid and gently stir the mussels. If some of them still haven't opened, put the lid back on and allow to cook 1 more minute. Reduce heat to low and add the garlic, gently stirring it in. Push mussels aside to reveal the sauce. Add the dissolved cornstarch to the sauce, stirring well to incorporate. The sauce should thicken in about 30 seconds. As it thickens, gently stir the mussels to combine with the thickened sauce. Remove from heat. Taste-test the sauce, adding more fish sauce if not salty enough. If too salty, add a squeeze or two of lime or lemon juice. If too sour, add 1-2 more tsp. sugar. If not spicy enough, add more fresh garlic and/or fresh chili. When you're happy with the taste, scoop or slide mussels into a large serving bowl (or individual bowls). Pour the remaining sauce on top. Finish with generous sprinklings of fresh coriander and basil. Add lemon or lime wedges on the side. Serve with rice or crusty French loaf to help soak up the juices. A good white or blush wine pairs nicely with this dish. Enjoy!